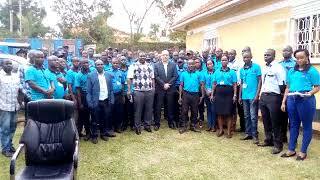 The initiative is part the nation’s Rural Income and Employment Enhancement Project implemented by MSC on behalf of the East African nation’s government, the Kampala-based company said in a statement on its website. The Jeddah, Saudi Arabia-based Islamic Development Bank is funding experts from Bank of Khartoum to develop a framework for the implementation of Islamic micro-finance in Uganda, according to the agency. Uganda’s parliament amended laws governing finance to accommodate Islamic financial products in January and the central bank says it is developing regulations for the system. Government and IDB officials profiled potential projects and clients in past visits that can be funded through Islamic financing models, which thrive in a co-operative union set up, according to the statement. Identified projects are mainly in agricultural processing and manufacturing. MSC will commence with three models; Musharaka, Mudaraba and Murabaha, out of five Islamic products identified during study visits to Sudan and Bangladesh, according to the statement. Uganda has “a lot of potential” for Islamic banking, Juma Lubega, executive-director of the Libyan-owned Tropical Bank, said in an interview on July 5, adding that his bank is raising funds in readiness.